Is the Use of Supplemental Vitamin C and Zinc for the Prevention & Treatment of Pressure Ulcers Evidence-Based? Published by John Wiley and Sons, Ltd.. The full text of the review is available in The Cochrane Library (ISSN 1464-780X). 予備的結果では、simvastatin-80-mg群で多くの筋症発症 (52例 [0.9%] vs １例 [0.02%]). * That rhabdomyolysis is a rare class effect associated with statins. * The increased risk of muscle injury with the 80-mg dose of simvastatin compared with the use of lower doses of simvastatin and possibly other statin drugs. * Whether simvastatin is clinically appropriate. * Discussing with patients the benefits and risks of simvastatin. * Potential drug-drug interactions can occur with simvastatin. Food and Drug Administration. FDA Drug Safety Communication: Ongoing safety review of high-dose Zocor (simvastatin) and increased risk of muscle injury. March 19, 2010. Available here. Food and Drug Administration. FDA warns about increased risk of muscle injury with Zocor [press release]. March 19, 2010. Available here. Ruilope LM, Dukat A, Böhm M, et al. Blood-pressure reduction with LCZ696, a novel, dual-acting inhibitor of the angiotensin II receptor and neprilysin: a randomized, double-blind, placebo-controlled, active comparator study. Lancet 2010; DOI:10.1016/S0140-6736(09)61966-8. Available at: http://www.thelancet.com. Neprilysin is a type II membrane-associated peptidase with the active site facing the lumen or extracellular side of membranes36-39 (Fig. 6.3). This topology is favorable for the degradation of extracytoplasmic peptides such as Αβ. Furthermore, we devised to establish quantitative immunofluorescence visualization of neprilysin using neprilysin-KO40 mice as a negative control. (We actually had to test several tens of combinations of antibodies and protocols to optimize the experimental protocols). We have confirmed that neprilysin is essentially exclusively expressed in neurons, not in glia, and that the peptidase, after synthesis in the soma, is axonally transported to presynaptic terminals40 presumably in a manner similar to the way APP is transported. 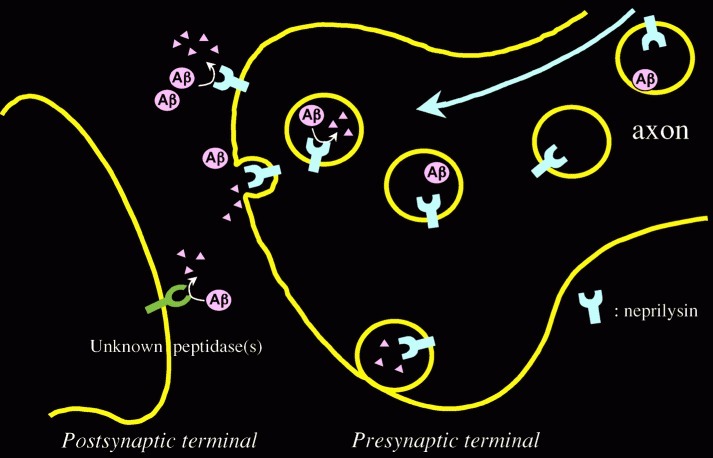 Therefore, presynaptic terminals and nearby intracellular (lumen-sided) locations are likely to be the sites of Αβ degradation by neprilysin (Fig. 6.4).